Large Crabgrass (Digitaria sanguinalis) is a monocot weed in the Poaceae family. In France this weed first evolved resistance to Group A/1 herbicides in 2005 and infests Carrots. Group A/1 herbicides are known as ACCase inhibitors (Inhibition of acetyl CoA carboxylase (ACCase)). Research has shown that these particular biotypes are resistant to cycloxydim, fluazifop-P-butyl, haloxyfop-methyl, and quizalofop-P-ethyl and they may be cross-resistant to other Group A/1 herbicides. Herbicide resistances on weed grasses in France are spreading nowadays in winter crops. But in some regions like les Landes were intensive spring crops are predominant some populations of Digitaria sanguinalis are not controlled anymore with fops and dimes used in carrots and green beans. Almost all the samples we tested are completely resistant to fluazifop, cycloxydim, haloxyfop and less to quizalofop. This range of resistances could be due to a target site mutation. Moreover the sudden spreading of spots with resistant plants all over the region of the carrot production is hard to explain and could be due to specific cultivation conditions of these crops. 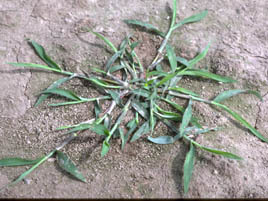 Greenhouse, and Laboratory trials comparing a known susceptible Large Crabgrass biotype with this Large Crabgrass biotype have been used to confirm resistance. For further information on the tests conducted please contact the local weed scientists that provided this information. There is no record of differences in fitness or competitiveness of these resistant biotypes when compared to that of normal susceptible biotypes. If you have any information pertaining to the fitness of Group A/1 resistant Large Crabgrass from France please update the database. The Herbicide Resistance Action Committee, The Weed Science Society of America, and weed scientists in France have been instrumental in providing you this information. Particular thanks is given to Jacques Gasquez for providing detailed information. Gasquez, J., and G. Bay. 2007. Digitaria anguinalis: A new species resistant to ACCase inhibitors in France. AFPP - Association Française de Protection des plantes : 141 - 148. Herbicide resistances on weed grasses in France are spreading nowadays in winter crops. But in some regions like les Landes were intensive spring crops are predominant some populations ofDigitaria sanguinalisare not controlled anymore with fops and dimes used in carrots and green beans. Almost all the samples we tested are completely resistant to fluazifop, cycloxydim, haloxyfop and less to quizalofop. This range of resistances could be due to a target site mutation. Moreover the sudden spreading of spots with resistant plants all over the region of the carrot production is hard to explain and could be due to specific cultivation conditions of these crops..